Site regulars, if such animals actually exist, will know that there's one genre I simply can't be objective about, and that's martial arts cinema. I grew up with these movies, a cinematic rite of passage for a young teenager taking his first underage toe dip into the world of adult action cinema. It's a love affair I never got over, and to this day will still forgive the simplistic plotting and characterisations the genre seems to specialise in to get to a few stonking good fight sequences. In 2003 a new star arrived on the martial arts scene with a very big bang. Tony Jaa not only hailed from Thailand rather than Hong Kong, but introduced the film-going public to Muay Thai, a martial art of wincing brutality in which elbows and knees are as viable as weapons as fists and feet. 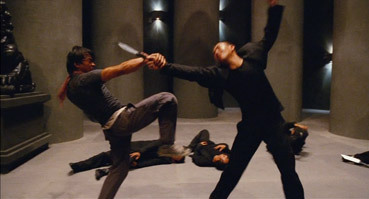 It was a film that starkly separated the martial arts cinema fans from the general movie-going public – while the former (myself included) were enthusing about Jaa's fighting and athletic skills, the film's rejection of CGI and wire work and stunt doubles to deliver action sequences that genuinely made your eyes bulge, the latter were complaining that the story was a bit weak. Whenever I hear that I wonder just how many kung-fu films these people have seen. Bloody hell, almost none of them have great stories. In martial arts cinema the law of binary opposition rules the roost – it's good verses evil and the plot functions only to move you from one action sequence to the next. In this genre, the fight scenes really are the film's one and only raison d'être. And on that score, Ong-Bak did just about everything right. A lot was riding on the follow-up film, whatever form it might take, and news that Jaa was once again working with director Prachya Pinkaew certainly upped the stakes. Even before it arrived it was a foregone conclusion that the film would once again divide the audience, and advance critical reaction only served to confirm this. Now it's here, on DVD, and I can state categorically that if you had issues with Ong-Bak because of the storyline then you're going to have exactly the same problems here. But if you were thrilled in any way by Jaa's auspicious career-launcher, then the chances are you're going to find plenty to get excited about in Tom yum goong, as as it's been titled for western audiences, Warrior King. If you've seen Ong-Bak (and you should have by now) then you'll already be aware that in this new breed of Thai martial arts film, when people get hit, it hurts. And there's no "wait-for-it" tease this time around – just minutes after the elephants are whisked away, Jaa explodes into a club full of bad guys and introduces them to a world of serious pain. It's here that we get a full taste of things to come, both good and not-so-good. 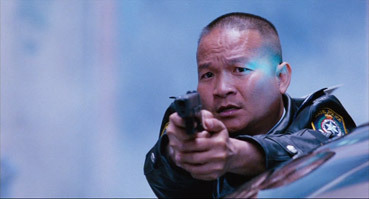 The bigger budget allows Wongkamlao to follow this fight with a high-speed boat chase, complete with spectacular crashes and comic asides, but it's impact is lessened by a relentlessly waggly camera and frantic over-editing – James Bond this is not. We also get our first glimpse of a visual tick that I, for one, find incredibly irritating, a sort of variable focus filter that throws part of the picture into blur in the manner of a music video visual (or an old, vaseline lens wedding photo). It's employed here randomly but with infuriating regularity – at one point every fifth shot seemed so afflicted. From this point on the balance of elements is much as expected, a little bit of plot followed by a burst of action, and here's where the film comes into its own, though once again the path is not a consistently smooth one. A Jackie Chan-style battle against drug dealers, BMX bandits and fluorescent tube wielding rollerbladers, for example, suffers a little at the hands of less-than-ideal camera angles, machine-gun editing, and a drifting stedicam that struggles to keep up with Jaa as he leaps and darts in and out of parked tram cars. And if this were the only major action scene in the film, then Warrior King might indeed have a problem. But it ain't, not by a long shot. There were three times during Warrior King when my jaw hit the floor. The most visually splendiferous is a fight in a burning church that plays almost like a demo for a high definition version of the video game Tekken, as Jaa goes up against Eddie Gordo, an armour-free Yoshimitsu and a hulking Craig Marduk ("I'll break your face! "), but all of this is for real and, as ever, effects and wire-work free. The Eddie Gordo stand-in in particular is a dazzler, his Brazilian Capoeira fighting style a whirl of spinning limbs and gymnastics, though the sheer size of Marduk in comparison to the diminutive Jaa looks almost like the result of Lord of the Rings style CGI trickery. Altogether nastier is a climactic battle against a veritable army of black-clad warriors, a fight almost absurd in scale that is nonetheless probably the single most violent hand-to-hand combat I have ever witnessed. Jaa doesn't simply punch and kick here, he breaks arms, legs and necks, and twists limbs out of shape to some of the most horrible sound effects I have heard in a martial arts film. And it goes on for ages. Imagine the sequence in Kurosawa's Red Beard where Toshiro Mifune's doctor loses his rag and uses his knowledge of anatomy to incapacitate a rowdy gang and multiply it by twenty. Even I found myself mid-way through thinking "Enough! You've won! Leave them alone!" It's still a bravura piece of choreography, but a genuinely wince-inducing one. But the real show-stopper, the sequence that every fan of martial arts cinema should see the film for, has Jaa make his way through a large, three-storey, criminal-run club/restaurant and fight a total of 30 opponents (I counted 'em), smashing their heads into windows, throwing them through wooden screens, assaulting them with furniture, and even picking them up and hurling him off the balcony into a display two storeys below, and it's all done in one, 3 minute 46 second stedicam shot. The planning, timing and stamina required to pull this off are just mind-bending, but pull it off they do. It's a stunning marriage of fight choreography, stunt work and camera direction that actually has a dramatic pay-off when Kham discovers just what is located on the top floor, as darkly and inventively twisted an idea as you'll find in a film all year, and all the more disturbing because it very probably exists. So yes, the story is flimsy, but Warrior King delivers where it counts and is an absolute must-see for all genre fans. Jaa confirms his status as the most exciting screen fighter around today, and if he could just drop the MTV visuals and editing and get himself a decent script, then director Petchtai Wongkamlao could yet climb to the very top of the action tree. 1.85:1 and anamorphically enhanced, the picture quality does vary a little, with grain far more noticeable in some scenes than others, though this appears to be very much down to the lighting conditions and the stock used – there was certainly no way to light the four minute take at normal movie brightness levels given the ground covered, resulting in a film speed shift for that and similar sequences. Elsewhere the picture is very impressive, notably the opening sequences in Thailand with the elephants, where colour, contrast and detail levels are first rate. Thai 5.1 and DTS tracks are available and both are first rate, with very specific use of surrounds and a splendid dynamic range. The DTS track is noticeably louder than the 5.1 and has considerably more oomph in the action sequences, especially when the LFE bass kicks in. In here you'll find the Original Theatrical Teaser (1:07), two Original Theatrical Trailers (2:07 and 2:39), the UK Theatrical Teaser (0:57), and the UK Theatrical Trailer (1:00). If trailers are your thing, there's certainly enough variety here to keep you happy. Also here is On the Press Trail (12:28), which consists of Jaa showing his stuff at various international press conferences, fight demonstrations and screenings, inexplicably set to music that largely drowns out the live sound. It's still seriously neat to watch the stunts being done live without camera and editing trickery. Jaa's genre superstar status is clearly evident here. Petchtai Wongkamlao (14:35) talks about his early career as a stand-up comedian and his gradual switch to film acting, his struggles with the English language (which he has to speak in the film), and working with Jaa and director Pinkaew, whose quiet voice he takes the piss out of and whose physical appearance he suggests makes him look more a supermarket butcher than an action movie director. He also reveals that he's a big fan of Rowan Atkinson and David Beckham, to whom he claims to have a strong physical resemblance. This is a lively and entertaining interview that nicely showcases Wongkamlao's cheery personality. Bongkoj Khongmalai (4:35) briefly talks about playing the token female role of Pla in the film and working with director Pinkaew. Director Prachya Pinkaew (14:57) discusses the production of Warrior King and the problems associated with following up a success like Ong-Bak, and the importance of elephants to the Thai people. He also discusses the shooting of individual scenes, including the four-minute take. Stunt Co-Ordinator Panna Rittikarai (10:36) covers expected ground, but in interesting detail, especially when discussing working with Jaa. Inevitably the four minute take gets covered. All of the interviews are in Thai with optional English subtitles. Revolution Uprising: Pre-Production Action (13:46) begins with an announcement about the image quality, as this was shot on what looks like mini-DV during the rehearsals and there is a small amount of image break-up in places. It consists of fight sequence rehearsal footage that has been shot and edited as a sort of training run for the movie proper. It has also had music and the same punch noise for most of the hits added, though not, I suspect, by the Warrior King crew. Good stuff, nonetheless. A Different Line: Multi-Angle Sequence (17:06) has several action scenes play side-by-side with an alternative cut of the same, using slightly different camera angles and cutting. Occasionally the alternative version is actually preferable, sometimes the reverse, but usually there's little in it. Making the Warrior: Cast and Crew Interviews (9:45) was shot on location in Australia during the production and focuses on the English-speaking cast and crew members. The film's weaknesses are plain to see, but so are its very considerable strengths. My advice is to forget the plot and go for the action and you will not be disappointed – Warrior King boasts some of the most startling, acrobatic and wincingly violent fight sequences you'll see all year. Despite some stiff competition from the boys in District 13, Jaa is still the present martial arts movie king. Premiere Asia's 2-disc release may lack Ong-Bak's enjoyable and informative commentary (by guess who), but in every other respect it delivers the goods. Warts and all, Warrior King comes brutally recommended.